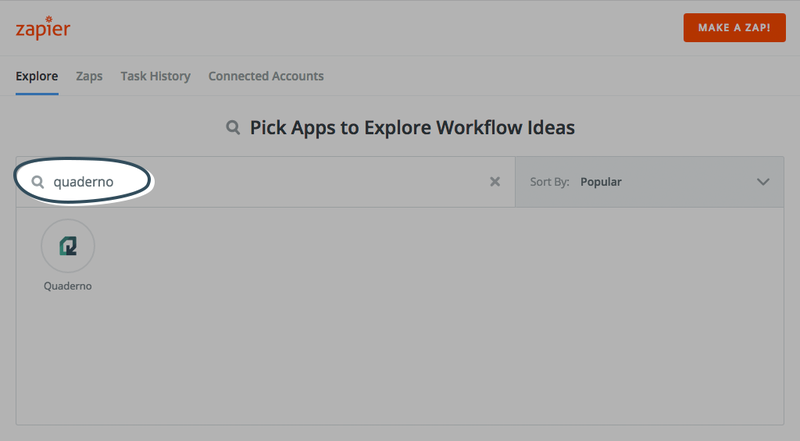 Zapier is a really great tool for users to connect different web applications together. For example, you can set up an automatic action so that when a new invoice is issued it is automatically stored in your Dropbox account. So let's jump into how to set this up! An integration between two apps is called a Zap, and a Zap is made up of a Trigger and an Action. Whenever the trigger happens in one app, Zapier will automatically perform the action in another app. 1. Go to Zapier and sign up to create an account. The basic account is free. 2. Once you sign up, click Explore and type Quaderno into the search bar. Click on the Quaderno icon. 3. You will see a list of zaps you can use. Click on the Zap you'd like to use. 4. Follow the instructions and connect your Quaderno account. And that's it! You now have set up your Zapier integration. If you would like more information about this feature, feel free to contact us. We offer the following integrations through Zapier, organised by category. If you don't see one you'd like, get in touch! We'll be growing this list over time. You can say goodbye to the days of painfully syncing customer data across your various platforms with the help of these Zaps! Keep your documents up-to-date, backed up and accessible all over the cloud with these Zaps. If you use Quaderno to handle invoicing but other applications for your accounting, you know that keeping in everything in order can be an uphill battle. Let us take the work off your hands with these helpful Zaps. 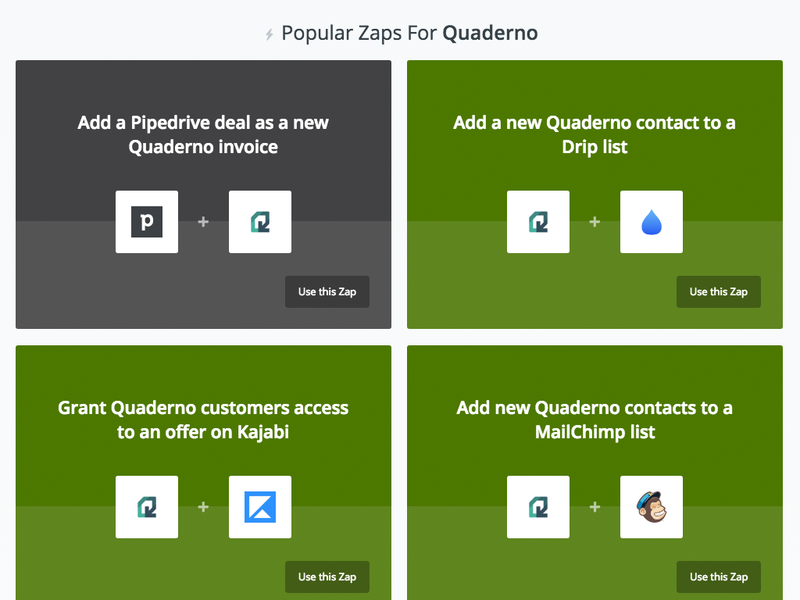 Stay up-to-date on the invoices being issued from your Quaderno account by getting notified on Slack with this Zap. You'll never miss another invoice. Mini-party every time! You can eliminate yet another tedious admin task by automating the way you record your expenses by automatically importing expenses whenever you update a Google Sheets file.